In a previous entry, I shared 8 Likely Places to Find Fresh Water for Dry Camping. Number one on the list was Fuel Stations where I stated, “… they will typically have a fresh water spigot available. But, if one is not readily available, just ask. As a result, we find that most attendants will make an effort to meet your request.” Number three on the list was dump stations. So during a recent trip through Red Lodge, Montana when I needed water and motor fuel, I headed for the Town Pump as my pre-trip research indicated they had a free dump station. I figured my odds were good at finding water as it was a fuel station AND a dump station which was 2 out of the 8 places where one is likely to find fresh water. 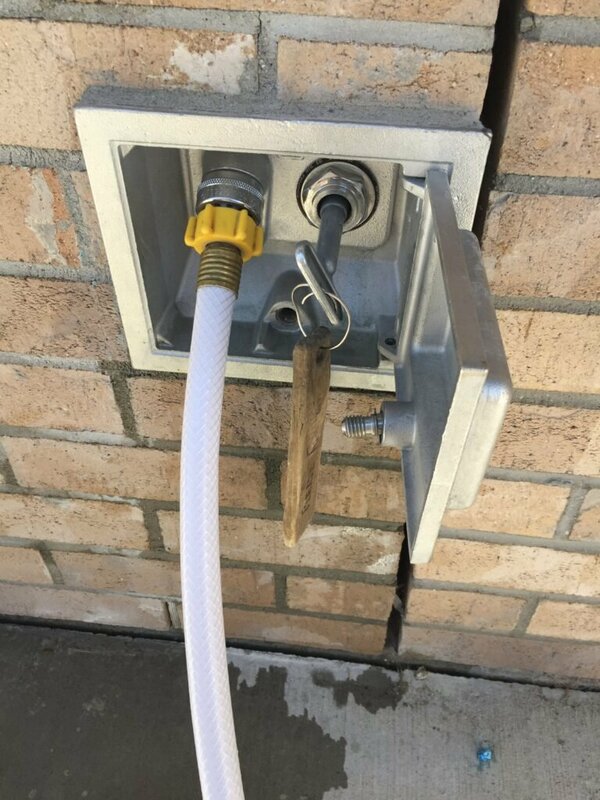 While fueling, I walked over to the dump station to discover it only contained a red water spigot clearly marked for tank rinsing only. I walked farther down the curb hoping the potable water spigot might be located away from the sewage port to reduce the chance of contamination, but no luck. I then proceeded to look along the building in hopes of finding a faucet and met with success finding an open hatch revealing a faucet, only to find it took a water key to turn it on. The next step was for my wife to go in the store and ask if potable water was available while I finished fueling. She returned in short order with a key on a large “key tag” just like you receive when asking for a restroom key that establishments don’t want you taking home in your pocket. Obviously, we weren’t the first RVer to request potable water—they were prepared! Kudos to the folks at the Town Pump in Red Lodge! Oh, by the way—the fuel prices were the best in town too. Asking and receiving, just another adventure in RVing! What have your experiences been finding potable water while on the road? Please share using the comment box below. Nice place, I grew up in Red Lodge before round-a-bout & Town Pump. Also a good place to buy Red Lodge Ales. Good beer, Oktoberfest is the best In the fall I get orders to bring back to Colorado Springs. We Just bought an RV so will be stopping there also when in Red Lodge. Also a good lunch is at Regis Foods or Café, They have gardens in the back so all fresh produce. Lots of other good things to see in Red Lodge. We were there in July, 2018. Had the same experience. Nice people behind the counter even though they were busy. Kudos to that merchant for their hospitality. 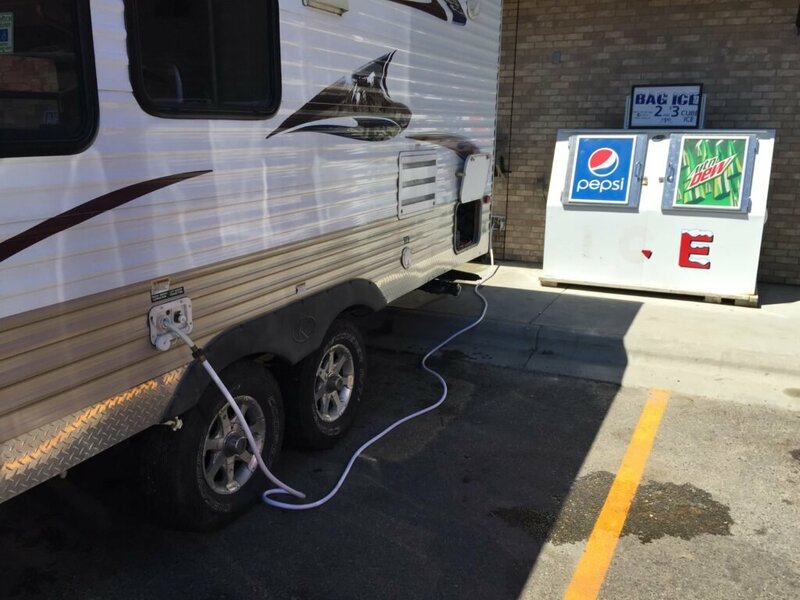 Neighboring Idaho is the best place we have found for RV dump stations. RVs are so popular there (and the state so determined to prevent illegal dumping) that many towns, large and small, have free or “donation requested” public dumps. We have used them all over the state, but the best was next door to the sheriff’s office in Coeur d’Alene. A paved, multilane one with potable and non-potable rinse water! Pocatello also has a double lane paved dump station with potable water, free. It is located on the south end of town east of 5 th street.